In three weeks’ time the Royal Opera will revive its version of Falstaff which, with Bryn Terfel in the title role, will doubtless sell out. But in Garsington’s new Falstaff it now has a stylish rival. Nothing could be more lo-tech than the cardboard sets of Giles Cadle’s designs for Bruno Ravella’s Edwardian staging, in which we encounter Meg (Victoria Simmonds) and Alice (Mary Dunleavy) as placard-toting suffragettes: the production has strong feminist drive. But the world it embodies feels intensely real, as does the comedy acted out in it. This is thanks primarily to Henry Waddington’s Falstaff, in the most convincing, moving, and beautifully-sung portrayal of that role I’ve ever seen. In contrast to Terfel’s broad-brush caricature, Waddington’s Sir John is a supremely subtle creation. We don’t think to question his paean to his paunch, and we listen with respect to his disquisition on the uselessness of ‘honour’. His preening sexual vanity – arrayed in kilted tartan splendour– is conveyed with perfect comic timing; his predatory attitude to women is pure Weinstein, his fall has pathos, and the energy with which he galvanises the stage in the denouement is gloriously life-affirming. He is supported, moreover, by an exceptionally strong cast. Dunleavy’s Alice makes a vibrant and commanding foil to Richard Burkhard’s explosive Ford, whose aria of jealous rage is delivered with his body literally crumpling with impotence. Soraya Mafi’s Nannetta and Oliver Johnston’s Fenton are sweetly matched vocally, with Johnston delivering his musings in Act Three in a gorgeously Italianate bel canto. 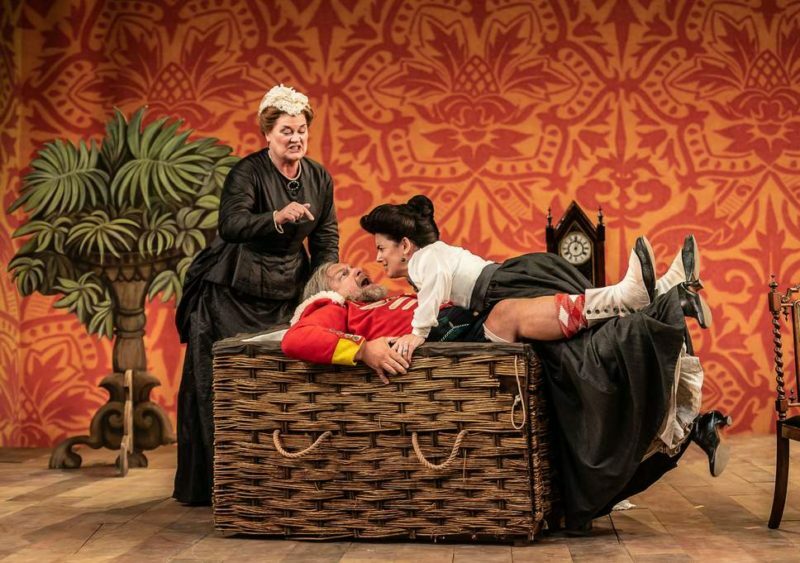 Yvonne Howard’s formidable Mistress Quickly calls the shots with wicked effectiveness, while Caius, Pistola, and Bardolfo are types you might meet in any pub. Malcolm Rippeth’s lighting creates enchantment for the nocturnal high jinks in the forest. But the real secret of this show’s success lies in Bruno Ravella’s direction, which scintillatingly mirrors the quicksilver intricacy of the score here brightly rendered by the Philharmonia Orchestra under Richard Farnes’s baton. The sight-gags come and go so fast the eye can barely keep up, and the movement direction gives a brilliant impression of spontaneity; Falstaff’s ditching into the Thames is ingeniously contrived. The fly in the ointment on opening night was a pop concert on the other side of a neighbouring hill, whose pounding bass undermined the serene beauty of Soraya Mafi’s lovely aria as queen of the fairies. That shouldn’t happen again.